What a week!! it was so fun! tracie and her family (tracie, darren, porter, mason, lindsay, spencer, tanner) came late last friday night. we had such great times! on monday we went to this train park in scottsdale and rode the little train there. on st. patricks day i spent most of the day riding quads and later we went to fountain hills to see the green fountain. on wednesday, we went to a resort in scottsdale and went swimming. then, that night, porter and I went to my cousins, tyler and kaylee's, house. we played 007 and ate pizza and just talked. it was so fun!! on thursday, our whole family went to mesquite wash to ride quads. i got soo sun burnt! i have a huge farmers tan on my arms! yesterday, me, porter, cameron, lindsay, and spencer made a video. it was a talk show that porter and i were the hosts. we had interviews and commercials. it turned out really funny! last night me, natalie, and porter stayed up until 3am to make the most of the time left to be with them. they left at around 10:30 this morning. this house is so empty and sad. i miss them already. today i went shopping and got a new church outfit. well i better go! im so not excited for school! things that have been happening. yes it has been awhile since i have posted so i kinda have a lot to say. well first is a pic of me and lacey. she's only like 5 days old in this pic so she loooks different, but still so cute and small. next......I GOT A PHONE!!!! yep its my sister's old phone...its kinda a long story how i got it and the conditions and stuff but yea. 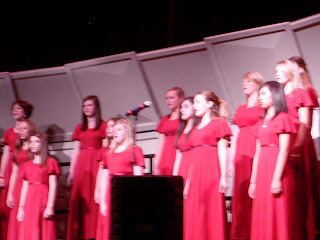 on tuesday it was my chorus concert! it was so fun!!!! i got my friend heidi to take pictures for me so here are some of them! these are my girls!! 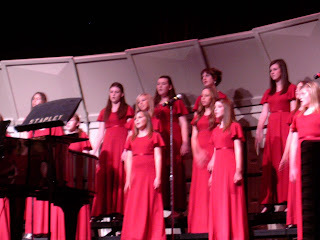 we are the advanced girls choir at my school. im not in this pic but a lot of my friends are! 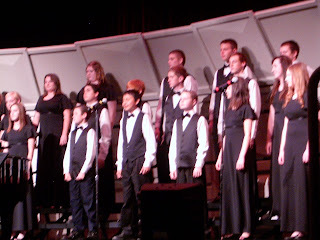 this is the advanced mixed choir that im going to be in next year! its going to be so fun! and finally my side of the stage! im an alto! its so fun! 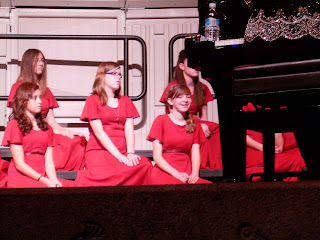 thats us sitting down while someone was doing a solo. i was just sitting there lauging at heidi taking the pics! so yea, my life is fun! this weekend is going to be soo fun! its lehi days!!! lehi days is this rodeo and dance my stake does every year at my church building! its a blast! then after the rodeo on saturday im going to a family party and i get to see my cousins that i miss so much!!! yep im really excited! talk to ya later! !